I've uploaded a video demonstration and a commentary of the use of one of the prototype Version 1 devices. 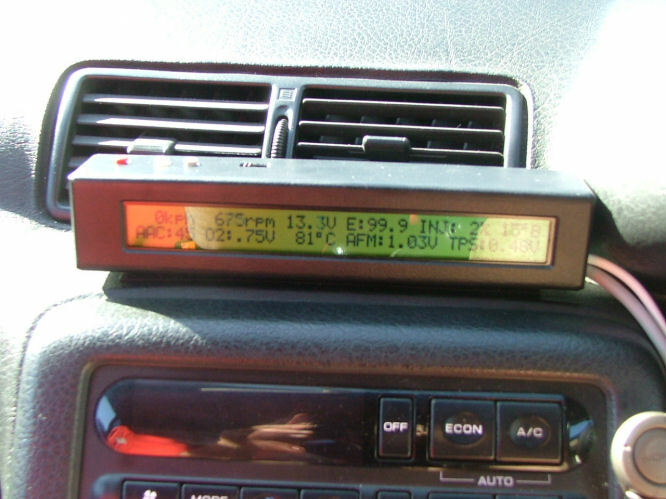 The Consult LCD Display is able to connect to vehicles supporting the NISSAN consult diagnostic protocol (usually evidenced by a 14 pin grey diagnostic connector located near the fuse box), supporting most NISSAN cars produced in the 1990s. The LCD Display is "two circuits in one", either having the LCD communicating with the car's electronic control unit (ECU) and displaying information on the 40x2 backlit LCD display, or used as a consult interface to faciliate the connection of a laptop for extended datalogging or diagnostics (whereby the LCD will not be able to communicate with the ECU). There is a switch on the top of the device that switches between LCD (left) and Consult Interface (right). You can use the ECUTalk Consult Software on a Laptop/Pocket PC with the display set to Consult Interface. The device is 188mm wide, 37mm high (39mm with buttons) and 28mm deep, and weighs around 300g (depending on cable length). It is quite compact is takes up only slightly more than the LCD display itself does (which is 182w x 33.5h x 14d without connector). The enclosure for the device is custom made for this purpose (which means final cost is a bit higher than I'd have hoped, but it looks really good). This means there are many convenient mounting positions, such as on the steering column or on the dash. It has a right side and a rear holes for possible cable exits. It has two cables from the device - one for the integrated consult interface (serial connector, plug into serial port on laptop) and one to the consult port (genuine consult connector). The device itself has 3 buttons (red, white and grey/black) on the top of the device, going left to right from the left of the device. The buttons are used to navigate through menus and the different features of the device. The red, or leftmost button, is the enter/select button, which either initiates the menu (from the main display screen) or selects the currently selected item from any other menus/screens. The white (left) and grey/black (right) buttons control the position of the cursor mainly in any of the menus. It should be pretty easy to work it out when you use it, so no user manual is required. About 10mm to the right of the buttons is a switch (only slightly above the surface, and might not be very visible in the picture). 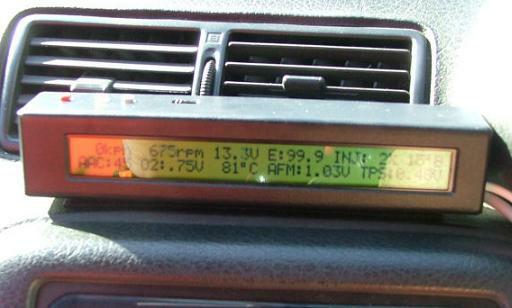 This switch selects between lcd display (LEFT) and consult interface (RIGHT). The screen is a standard 40x2 backlit screen, wide temperate (-20 to +70 operating, -30 to +80 storage), and has the best viewing angles ive yet to see in a 40x2 screen (50 above, 60 below, and 40 left or right), let alone a wide temp version which is needed for keeping in hot cars (pun intended). 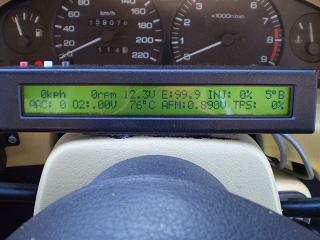 Sensor Display (the default, as picture above). Read Error Codes: Shows code number, short description (no need to look it up), and number of times the engine has started since code last recorded. Up to 3 are shown at once. Configuration options: Speed kmh/mph, TPS Volts or percent (percent requires manual setup of minimum/maximum TPS points), Temperature degrees C/F, Economy L/100KM (which has cylinder number and injector size setup) or alternate fuel economy (10 * speed divided by injectory duty cycle). Options are stored and retained when car is turned off. Time Trials (0-60, 0-100, 0-160, 400m): Records distance, time, and stores best time (retained when car turned off). This module sold 50 units during Q4 2006, mostly to Australian users. Feedback and suggestions from these users have been incorporated into the Version 2 display, which is currently in development (see top of page).